Sudan is the first country that Islamic Relief worked in, responding to a devastating famine in 1984. We registered our field office in 1991. Since South Sudan declared independence in 2011, Islamic Relief Sudan has continued providing essential aid to poor people in both countries. Currently, we have two offices in South Sudan: Our Central Equatoria State office is located in Juba, whilst our Tonj North County office is based in Warrap. In 2004, we helped to set up a health clinic serving over 50,000 people in Tonj North, Warrap State. Three years later, 20,000 people were vaccinated against meningitis during an emergency response delivered by Islamic Relief. 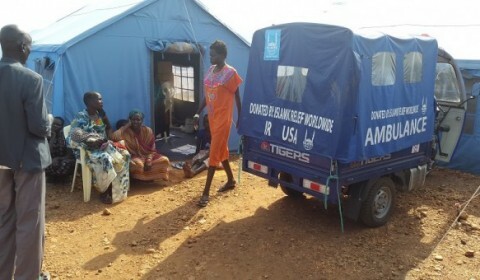 With UNHCR support, we managed a camp for Ethiopian refugees seeking safety in Juba. Thousands of children in the area benefited as we completed the construction of four new schools in 2008, and in 2012 we delivered an emergency project to provide families returning to Juba with access to water. Over 150,000 poor people benefitted from our project in Terekeka, and Tonj North. The scheme, which completed in 2011, improved access to drinking water and also helped prevent the spread of disease by promoting good hygiene. Current programmes include water and sanitation, emergency response and healthcare covering Central Equatoria, Kuda, Terekaka and Warrap. We are also supporting South Sudan’s most vulnerable people – particularly women and children – to achieve sustainable economic and social development.